Navigating family law matters can be difficult without a knowledgeable guide. And it can be costly, because it is more expensive to fix mistakes than to do things right the first time. When you need help with a family law matter, you want a lawyer on your side who can guide you smoothly through the process without wasting your time and incurring unnecessary legal fees. A lawyer's job is to inform - to make sure a client has all the information regarding what the law provides and judges' tendencies, etc. to craft a strategy - and then to advocate - to work tirelessly to achieve the client's goals. Over 90% of cases in family law settle without going to trial. Katherine Zopf settles cases favorably, but she is also a zealous advocate if you do go to trial. There is inherent value in knowing the system. Every court and every court case is different, and you want a lawyer who knows the system and can tailor arguments and strategies accordingly. 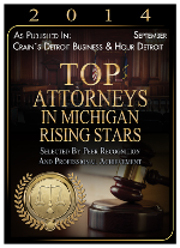 Katherine has been practicing law in the state of Michigan for over ten years and has seven years of family law experience exclusively in the Detroit Metro area. She has considerable trial and mediation experience and has gained the respect of judges, as shown by her numerous Guardian ad Litem, Receivership, and Arbitration appointments. Copyright © 2014 The Dream Firm. All rights reserved.